Few people can argue over the practicality of using all-electric vehicles for small trips. After all, a quick ride around the neighborhood is unlikely to arouse range anxiety. But what about taking a trip around the world in an EV? A group of EV advocates plan to do just that in Project EVIE, the first trip around the world in a production electric vehicle. Note the phrase “production electric vehicle”–a Swiss teacher named Louis Palmer has already driven around the world in solar taxi. But this project is intended to prove the viability of long trips in real-world EVs that we might one day actually drive. else you would do with a car–without destroying the planet. The trip won’t be easy. 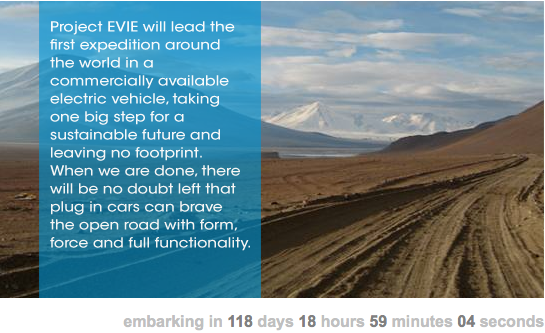 EVIE’s team expects to cross fifty countries and rack up 43,496 miles over the 18 month trip. And thus far, EVIE hasn’t even hinted at what car it plans to use. We’re still rooting for EVIE’s success, but it won’t be easy for others to mimic the trip without an extensive EV charging infrastructure in place–and that could take decades.